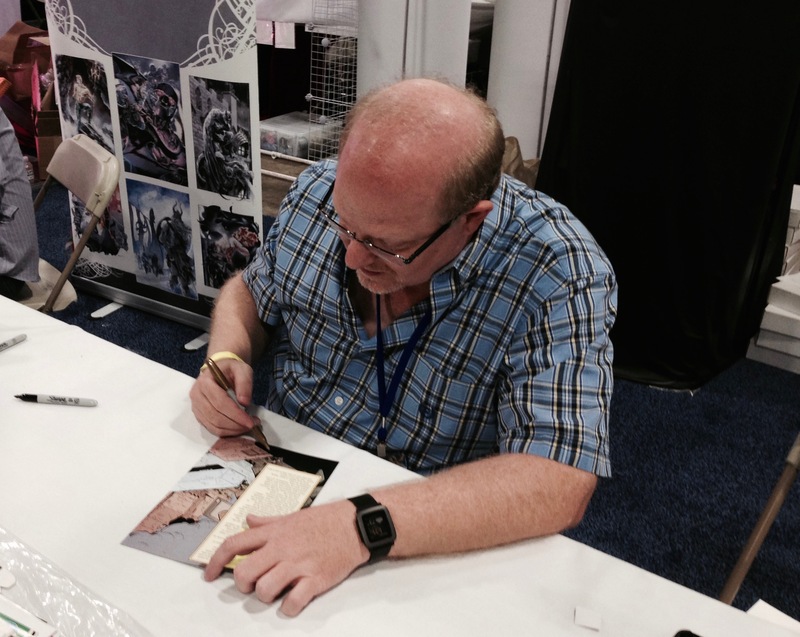 3 Questions With Mark Waid at Boston Comic Con 2016 – AiPT! Mark Waid’s a busy man. Peruse the shelves at your local comic shop and you’ll find the writer’s name on diverse series such as All-New, All-Different Avengers, Archie, Black Widow and Captain Kid. That’s not even taking into account the many trade paperbacks he’s helped make fixtures in readers’ collections. I’m talking about acclaimed runs on Captain America, Daredevil, Fantastic Four, Flash and, of course, Kingdom Come. The man knows how to craft a compelling story without having to rely on the gimmick of the month. Which is why, when you get the chance to talk to him, you make the time – even if Waid doesn’t have much of it to spare. AiPT! was fortunate enough to stop by Waid’s table at Boston Comic Con 2016 right when he was signing one fan’s stack of collectibles. It was the perfect time to ask the comics veteran with more than 25 years of experience three quick questions! AiPT! : What do you like about coming to Boston Comic Con? Mark Waid: The fans are super polite. I like the access of the convention. It’s not one of those where the hotel is so far away that it’s a major trek just to get here. As a guest, it’s good to go back to the hotel and recharge. I like the city and you get some guests here that you don’t normally get at other places, so it’s a good show overall. AiPT! : Marvel’s Vision is everywhere these days. He headlines his own critically acclaimed series, appears in your Avengers book and was featured in one of this year’s biggest films, Captain America: Civil War. Why do you think this synthezoid is having a creative resurgence? Waid: I think he’s one of those characters that’s gotten the short shrift. He’s like the Martian Manhunter of the Avengers. He’s the one that nobody pays attention to but everybody sort of has a secret love for. And honestly, once Captain America: Civil War movie put him in a sweater – that was awesome. I also think that Tom King is doing a great job of showing everybody how cool he can be. That book [The Vision] is excellent. AiPT! : When Kingdom Come was published in 1996, it was a chance to see what fans’ favorite characters looked like in more realistic costumes and settings, thanks to Alex Ross’ painted pages. When you look back, did you ever think there’d come a day when you’d see a live action Justice League movie? Waid: No! No, no, no, no. It honestly never occurred to any of us. We just assumed that that was the purview of comics and there wouldn’t be much chance for these characters to make it to the live action screen. Now I live in a world where there’s a TV show about the Atom and Hawkman and that’s very cool. There’s a very young Mark Waid inside me who is excited every time he hears the “Speed Force” on TV. AiPT! : Thanks for taking the time to chat, Mark!